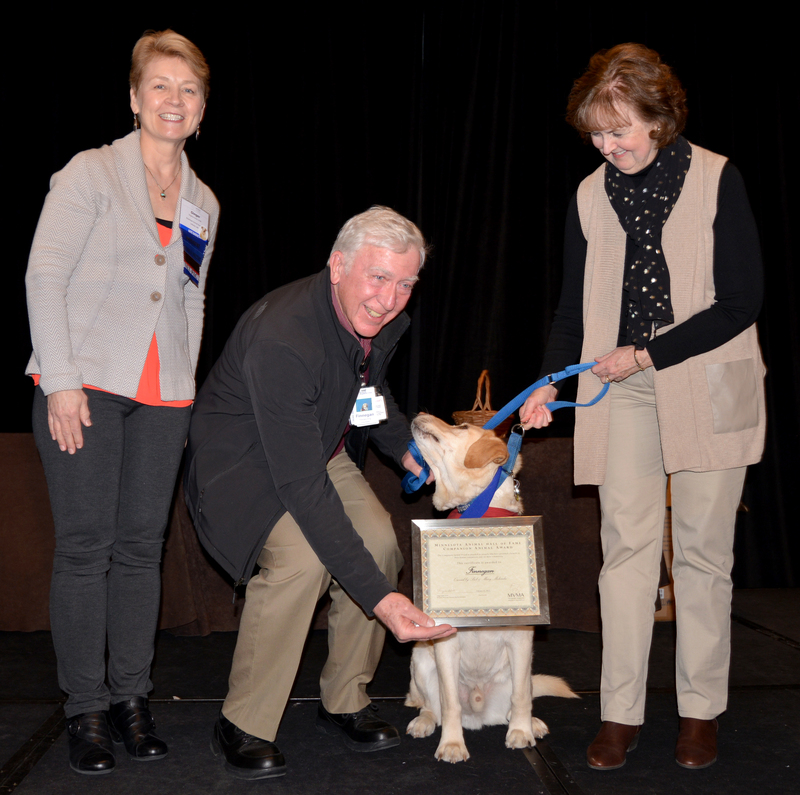 the MVMA awarded three exceptional animals at the 2017 annual convention. The Animal Hall of Fame added Hero, Companion and Professional animals to its list of inductees this year. Finnegan Molenda is a special dog. He is a seven year old yellow Labrador retriever who does not like water and does not like to get his paws dirty. What he does like are people. He has a special talent for working with kids and handicapped individuals. Finnegan was trained and certified by Therapy Dog International. Finnegan has had over 350 hospital visits. Finnie has touched many lives. Whether it is a special encounter in the lobby where he loves to meet and greet anyone with a moment to say “hi”, or the special way he has with the patients who become fast friends. Whether Finnegan is at his favorite spot in the hospital, the main entrance, or out on a walk about town, he waits for anyone and everyone to stop and pay attention. He has a routine of dog tricks that he performs for his captive audience. Everyone knows Finnegan. Every dog has a purpose. Finnegan found his and is loved by many, many people. 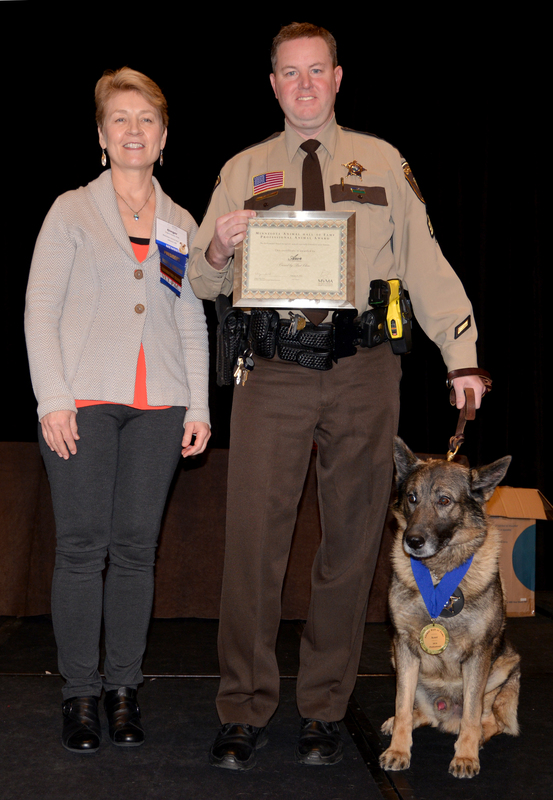 Hennepin County Sheriff’s Office K9 Azor has been in-service as a dual purpose Patrol, Narcotic detection dog for the past 5 years with his handler, Sergeant Bret Cline. K9 Azor came to the Sheriff’s office in 2010 from Slovakia where he as assigned to Sergeant Cline and they began their training together. After their initial 10 week training for patrol work and additional 5 weeks for narcotic detection they were certified to work the streets. K9 Azor has been a vital part of the Sheriff’s office and has been deployed 100’s of times for his services as either a patrol K9 or narcotic detection. K9 Azor has won two trophies for his performances in various certification trials throughout his career. 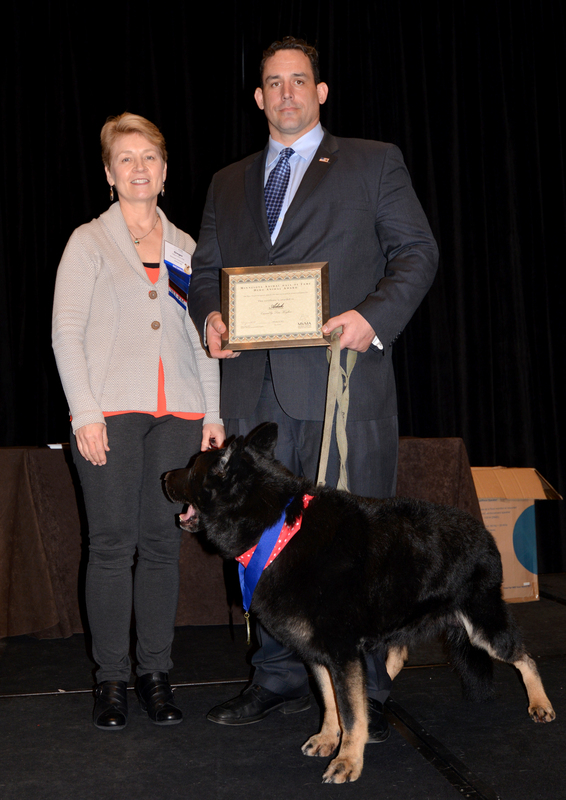 The Hennepin County Sheriff’s office would like to thank veterinarian, Dr. Stephen Mitchell, for the care provided to K9 Azor over the years. Hercules is no mythical Greek hero but he has done some pretty amazing things if you consider that the blood that he donates saves lives. Hercules is a 2,000 pound horse blood donor through a new blood donor program at the University of Minnesota’s Equine Center. He is capable of giving eight to ten liters of blood at a time. His blood is then given to other horses in need of blood. Hercules has become a mascot of sorts for the Equine Center and has participated in events as a way to raise awareness and funds for the Equine Center.